So yeah, I've pretty much exhausted every solution I can find on the internet to try and fix this. If anyone can offer more solutions, I'd be glad to test it out. I am not able to reproduce the issue on my side and I would recommend opening a support ticket for this. 2.) 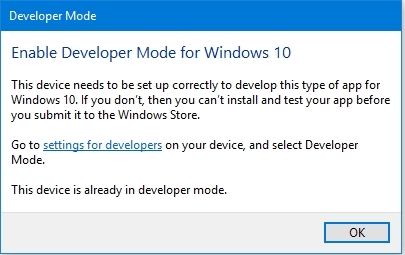 Under "App development" click the “Windows 10 Universal app development” OR "Windows 8.x app development” link based on where they are experiencing the problem. 4.) Then choose the "Start request" link to start a support request. Support incident charges will be refunded if they are caused by a Microsoft bug. Thanks MSDN Community Support Please remember to Mark as Answer the responses that resolved your issue. It is a common way to recognize those who have helped you, and makes it easier for other visitors to find the resolution later. Sorry for not getting back to this thread sooner. I even went as far as to do a fresh install of Windows 10 but when the problem still persists, I was about to give up. But I found out another solution that I haven't tried: move the project folder to the C: drive. Apparently, when I have the project folder on my D: drive, it wouldn't work and will show me the said error. Moving it to drive C: fixed the issue. That is such a stupid limitation and I don't know why Microsoft thought that was a good idea to implement. Just to be clear, the issue only happens with Universal Windows Apps projects. If I start a regular classic C# project and place the source into a different drive, the problems don't occur when compiling/running them. I just tried that, same thing. Does it deploy to a phone or the emulator? I don't have either, but I am making a desktop application, not a mobile one. 2. It seems it mentioned to renew the developer license. Did you try that? Renewing the developer license doesn't seem to be a thing for Windows 10 Universal Apps. I'll add that to my list above. Could you provide me a minimum sample demo in which this issue is reproducible? I will take a look on my side. Hi, this is about as bare bones as it can get. Launching this gives me the above error. I tested this on my side and it works fine. I suspect that it is environment issue. Try Repair / Reinstall Visual Studio. Hi, I just finished uninstalling Visual Studio 2015 and reinstalling. The problem is still here. Bingo! This is the problem. I've been going round in circles for ages and seen a lot of posts with a similar problem, all suggesting everything you've tried with nothing working. I've tried the same, move the project to C drive... works perfectly. This is a big issue as many people are now moving to SSD drives as their OS and application drive but do their work on another drive, often a regular hard drive. Many corporates set up like this now. The SSD is often small and data drive large, plus you don't really want to be doing builds on the SSD where it will do frequent writes. Is this a restriction with Universal Apps to only work on C drive? (and yet you can change apps to another drive on Windows 10, and I have done just that. Could that be an issue too?). Having to locate the project folder on C is limiting. If at least a project could local deploy to C but the development folder is kept wherever you like, that would be fine. This is also happening to me. I have tried ProcMon and other troubleshooting tools to see if the problem was with some path that gets broken when the project lives in another drive, but I couldn't find anything. At least Microsoft should document this in any of the UWA creation tutorials. Thanks for sharing your experience. I know I'm nearly a year late to the party but I still cannot figure out what kind of testing has been done in Redmond (or Hyderabad) for this issue to persist. I too have spent fruitless time harboring hope that some basic "checks and balances" may exist to warn the poor developer. "Unable to activate Windows Store app"
I have installed and reinstalled VS Studio Enterprise 2015 many times on this box with all latest updates and hot-fixes for VS and Windows but successful test of a Hello OpenCV exercise eludes me. I suspect that changing the default profile for the basic user (not Administrator) from C: to D: triggered the cascade of issues (e.g. File History does not work for this basic user but works for the Administrator since File History is still looking at C: drive for some info and I have no way to change the environment variable that drives this lookup by File History). Lesson learnt. Do not use D: drive for Visual Studio projects even if these worked previously. (In fact I can no longer change the installation drive for VS 2015 unlike previous versions). Sorry for long rant but your observations echo my predicament. I can confirm that there is an issue with UWP apps on other drives if the support end-user libraries are spread across. No Build error messages yet the run-time failures persist. There might be a issue on while debugging UWP app , the app got crashed & throwing message like "Unable to Activate Windows Store App ... ...the activation request failed with error "The app didn't start"". This issue is not happen while on release mode .